Prior to World War II Porsche designed and built three Type 64 cars for a 1939 Berlin-to-Rome race that was cancelled. In 1948 the mid-engine, tubular chassis 356 prototype called 'No. 1' was completed. This led to some debate as to the 'first' Porsche automobile, but the 356 is considered by Porsche to be its first production model. 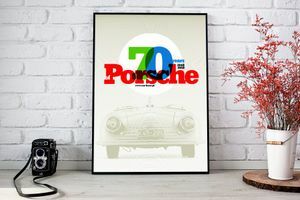 It was created by Ferdinand 'Ferry' Porsche (son of Ferdinand Porsche, founder of the German company), who founded the Austrian company with his sister, Louise. 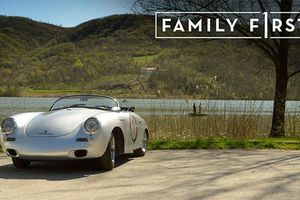 Like its cousin, the Volkswagen Beetle (which Ferdinand Porsche Sr. had designed), the 356 is a four-cylinder, air-cooled, rear-engine, rear-wheel drive car with unitized pan and body construction. 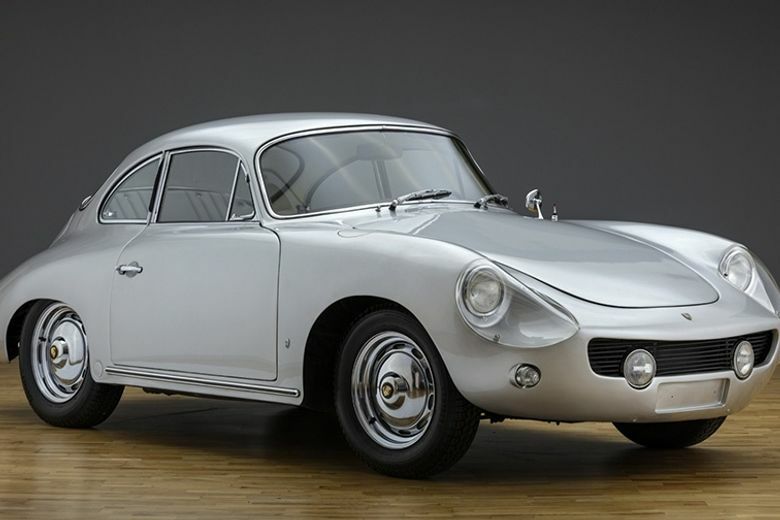 The chassis was a completely new design as was the 356's body which was designed by Porsche employee Erwin Komenda, while certain mechanical components including the engine case and some suspension components were based on and initially sourced from Volkswagen. 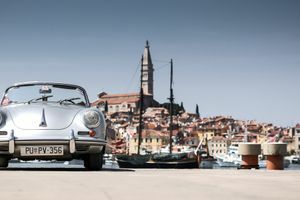 Ferry Porsche described the thinking behind the development of the 356 in an interview with the editor of Panorama in September 1972. '...I had always driven very speedy cars. I had an Alfa Romeo, also a BMW and others. …By the end of the war I had a Volkswagen Cabriolet with a supercharged engine and that was the basic idea. I saw that if you had enough power in a small car it is nicer to drive than if you have a big car which is also overpowered. And it is more fun. On this basic idea we started the first Porsche prototype. To make the car lighter, to have an engine with more horsepower…that was the first two seater that we built in Carinthia (Gmünd)'. The first 356 was road certified in Austria on June 8, 1948, and was entered in a race in Innsbruck where it won its class. Porsche re-engineered and refined the car with a focus on performance. Fewer and fewer parts were shared between Volkswagen and Porsche as the 1950s progressed. 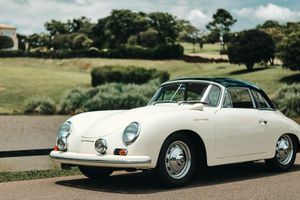 The early 356 automobile bodies produced at Gmünd were handcrafted in aluminum, but when production moved to Zuffenhausen, Germany in 1950, models produced there were steel-bodied. The aluminium bodied cars from that very small company are what are now referred to as 'prototypes'. Porsche contracted Reutter to build the steel bodies and eventually bought the Reutter company in 1963. The Reutter company retained the seat manufacturing part of the business and changed its name to 'Recaro'. 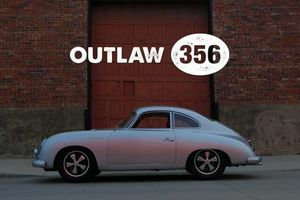 The 356 was built in four distinct series, the original ('pre-A'), followed by the 356 A, 356 B, and finally the 356 C. To distinguish among the major revisions of the model, 356s are generally classified into a few major groups. The 356 coupés and cabriolets built through 1955 are readily identifiable by their split (1948 to 1952) or bent (centre-creased, 1953 to 1955) windscreens. In late 1955 the 356 A appeared, with a curved windshield. The A was the first road going Porsche to offer the Carrera four-cam engine as an option. In late 1959 the T5 356 B appeared; followed by the redesigned T6 series 356 B in 1962. The final version was the 356 C, little changed from the late T6 B cars but disc brakes replaced the drums. In late 1959 significant styling and technical refinements gave rise to the 356 B (a T5 body type). The mid-1962 356 B model was changed to the T6 body type (twin engine lid grilles, an external fuel filler in the right front wing/fender and a larger rear window in the coupé). The Porsche factory did not call attention to these quite visible changes with a different model designation. However, when the T6 got disc brakes, with no other visible alterations, they called it the model C, or the SC when it had the optional extra powerful engine. A unique 'Karmann hardtop' or 'notchback' 356 B model was produced in 1961 and 1962. The 1961 production run (T5) was essentially a cabriolet body with the optional steel cabriolet hardtop welded in place. The 1962 line (T6 production) was a very different design in that the new T6 notchback coupé body did not start life as a cabriolet, but with its own production design—In essence, part cabriolet rear end design, part T6 coupé windshield frame, unique hard top. Both years of these models have taken the name 'Karmann notchback”. This particular car is a beautiful example of a 356 B 1600 Roadster from 1960. It boasts an unique California history of singular 54-year ownership, original engine and transmission, and professional restoration. Finished in Slate Grey, this Porsche was completed on 27 May 1960 and delivered new to the Ralph Cutright Co. dealership in Santa Monica, California. Cutright then sold the car on July 21, 1960 to its first owner, a resident of Los Angeles and later Manhattan Beach, California. She retained the car for decades, taking it off the road in 1979, but continuing to register the car through the 1980s and 90s. In 2013, the family decided to get the car running again, and ultimately decided that it should be restored in its entirety and therefore decided to sell the car to an enthousiast. The car was then restored to the highest standard by a well known Porsche specialist. Since then the car has been barely used. The car was imported to The Netherlands and now offered with EEC papers, ready to be enjoyed by a new owner. VSOC’s Sassenheim showroom is centrally located between Amsterdam and The Hague, only 17 km (11 miles) from Schiphol Airport. There is a broad selection of classic sports cars on display, in very good or excellent condition, varying from beautiful yet affordable sports cars to rare and valuable collectors’ items. When you intend to visit us in The Netherlands, we would advise you to make an appointment so that we can give you some quality time.